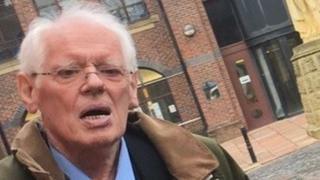 Image caption Derrick Cooper's regime was said to "instil fear and brutality"
The former owner of a Cumbrian boarding school has been jailed for 20 months for physically abusing two boys. Derrick Cooper, who ran Underley Hall, in Kirkby Lonsdale, was convicted of assault and cruelty following a trial at Carlisle Crown Court. The 77-year-old, of Hillberry Green, Douglas, Isle of Man, had labelled the allegations "fantasy". The abuse happened in the 1970s and 80s, and Cooper was acquitted of six other assault charges. The incidents included headbutting one boy and attacking another in the dining hall. Victim Sean Hann, of Heysham, Lancashire, described the school as an "evil, twisted place". Defence barrister Peter Wright QC said Cooper was a man in "poor health" and asked him to be sentenced "on the basis of isolated falls from grace". Judge James Adkin described the violence towards the pupils as a "huge breach of trust". During the trial, Cooper said he had not been responsible for any violent acts at his school for "maladjusted" boys. A number of other ex-school workers faced trial alongside Cooper. Former teachers James Farish, 58, of Oakwood, Kendal, and Trevor Taylor, 75, of Lower Park Royd Drive, Sowerby Bridge, were cleared of assault. Ex-maintenance manager David Hadwin, 71, of of Raygarth Gardens, Kirkby Lonsdale, was also cleared of a charge of assault occasioning actual bodily harm. Earlier in the trial, former teacher John Studley, of Silverdale in Lancashire, was acquitted of one assault allegation on the direction of Judge Adkin.